What’s with all the bad grammar in kids’ books? So, here’s a little rant that has me wearing both my “editor” and “mom” hats at the same time. I’ve been consistently impressed by my oldest daughter’s vocabulary and grasp of grammar as she gets older (almost 6! where does the time go?). I commented recently to my husband how impressive it is that she corrects her own grammar aloud and he said, “It’s because she reads.” And she does (The Boxcar Children at age 6? Seriously? Blows me away. But I digress.). The conversation got me thinking. Our kids learn the English language through what they hear spoken around them and from what they read, whether it is read aloud to them or they read on their own. I have three kids – only one is old enough to be reading on her own, the others need to be read aloud to. SO – being crazy about grammar (but I’m lightening up as the language evolves…grr), it DRIVES ME NUTS when picture books have poor grammar. If I want my kids to learn to speak properly, they need to hear the language used properly. 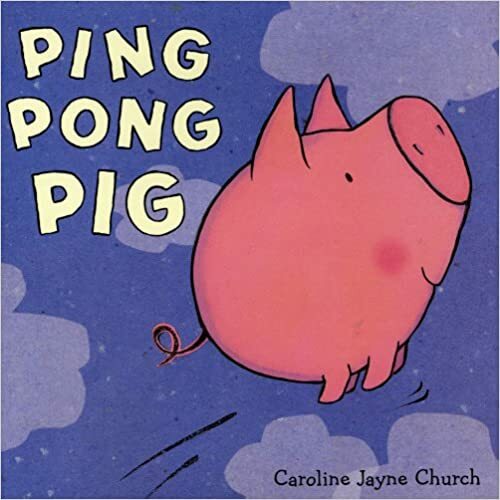 An example: One of my middle daughter’s favorite books, and mine, is Ping Pong Pig. It’s a fun story about a pig who is too busy trying to fly to help with the chores on the farm. Then his friends intervene and build him a trampoline so he can “fly.” Touched by their generosity, Ping Pong uses his new trampoline to fix all the messes he made on the farm while trying to fly. The whole “when pigs fly” thing is lost on the kids, but it’s a fun story. BUT. And this has bugged me for the entirety of the six years I’ve been reading the book. One of the last pages says: “Until something caught their eye.” Apparently it’s no longer up for debate whether “they” can be used as a gender-neutral singular pronoun (it can, though it still grates on me). At first glance, that might appear to be the case here, but it’s not. “Their” refers to Ping Pong’s friends — plural. Therefore, they cannot have an “eye;” proper agreement dictates that it read “eyes.” So, it should read, “until something caught their eyes.” Now, I recognize that this sounds silly but that’s just my point: we are conditioning ourselves and our children to poor grammar by filling our picture books with it. It starts to sound so normal that proper grammar all of a sudden sounds bad. Truth be told, I would just rephrase the whole thing to something that sounds better, such as, “until they noticed something,” to avoid the awkwardness. But I digress again. So, my “editor” hat says, “PLEASE let’s do a better job editing our picture books,” because I’m offended by poor grammar. But my “mom” hat says, “PLEASE let’s do a better job editing our picture books,” because I want my kids to learn to speak correctly. Clearly, Ping Pong Pig is not the worst offender — I’ve read much worse, and it hasn’t ruined my kids. BUT I’m debating going through all our picture books and eliminating every one with poor grammar. That, or writing in edits like my dad always did to the newspaper. Thanks for listening to my rant! Do you share my sentiments? Have you seen any offenders out there I should watch out for? Finally, if you are writing a picture book and need an editor, I’m happy to help! LOL, this sounds like something I would rant about.